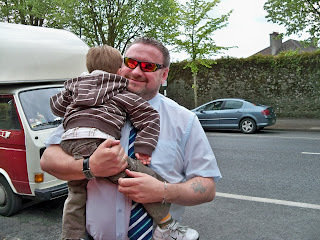 To this blog and to Dublin! It has been a while, but we are well an getting ready for an early morning ferry ride to Wales tomorrow. 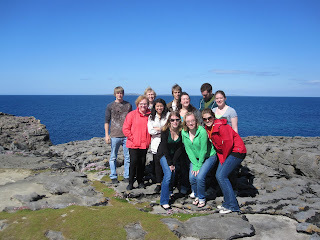 In the past few days we've seen quite a bit of Ireland's natural beauty and historical religious sites. The drive from each location was almost as beautiful as our destinations. We drove through Burreu, which means the Stone Place, and saw how farmers separated their farms with stone walls and stopped off at some beautifl cliffs over the ocean. 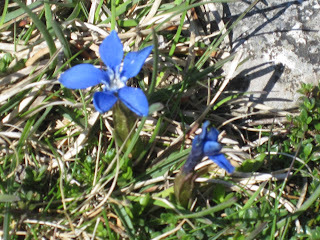 The blue flowers in the pictre above are illegal to pick because they are only found in this part of Ireland. 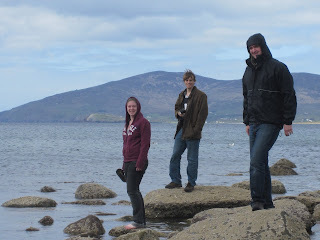 On Monday we drove the Ring of Kerry. 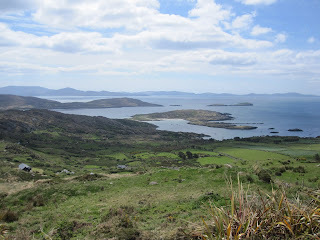 The Ring of Kerry is just a route around the southern County Kerry. We made plenty of stops to get beautiful pictures and to just revel in the natural beauty. 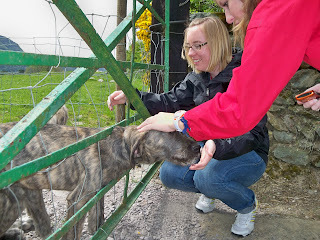 We were able to watch a sheep dog demonstration by a nice man named Brendan. 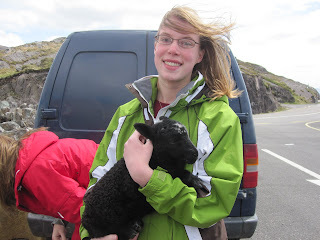 He raises sheep and trains sheep dogs. 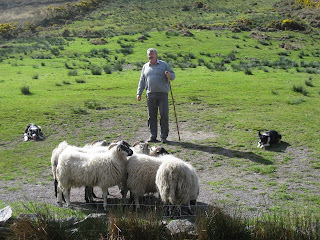 He usually keeps the sheep dogs for his work, but will sometimes sell the puppies after training them. These dogs are extraordinary. Brendan teaches each dog its own set of commands so Brendan can command them separately when they're in the fields working. Another stop was the coastal town of Waterville. We stopped off and walked along beaches that were very similar to our cold Oregon beaches. 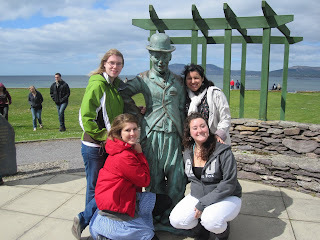 Waterville is also the last place Charlie Chaplain lived before he died. Damien was not technically supposed to be our guide, but he suggested the best places to eat, take pictures, and just experience Ireland. He was also ridiculously funny. 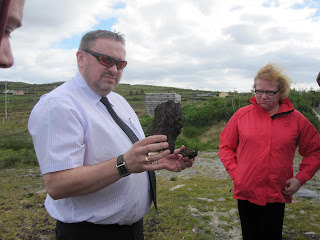 The picture below is of Damien explaining how the Irish have been using peat (decayed and dried out vegetation) for decades as fuel. 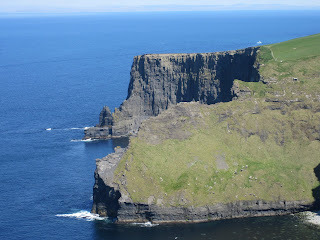 There were a few great spots that gave great views of the vallies in County Kerry. 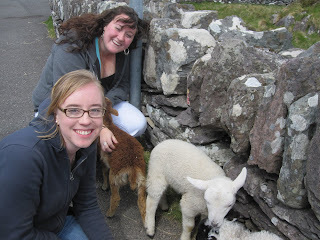 We also saw a man who had baby sheep and a baby deer with him. Needless to say, we were overcome with the cute factor. 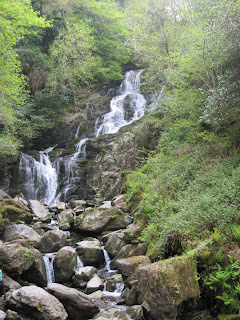 Our last stop on the Ring of Kerry was the Torc Wateralls in Killarney National Park. The fellas quickly took to climbing the waterfall and not withouth minor injury. But, what are you gonna do? 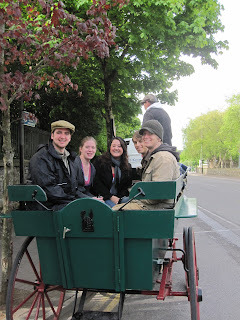 On Tuesday we started our morning off with a wonderful ride in a jaunting cart. 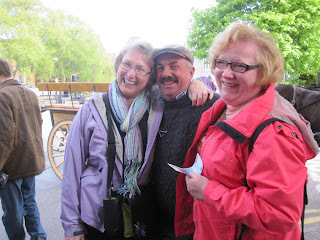 Our driver was hilarious and loved flirting with our single ladies; Terrie and Jerrie. 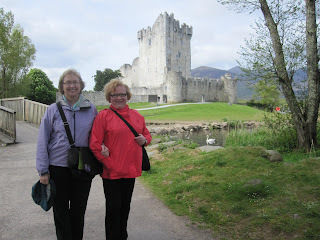 Terrie and Jerrie in front of Ross Castle. 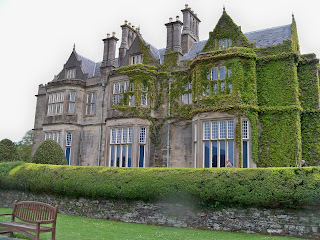 We also stopped off at the Muckross house and traditional farms. We took a tour of the house that had an expansive history starting in 1843 when it was built for a member of parliment. Sadly, we were not allowed to take pictures inside. 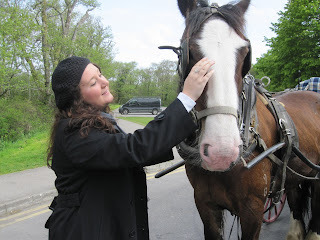 However, we did get a chance to walk around the traditional farms on the Muckross lands. 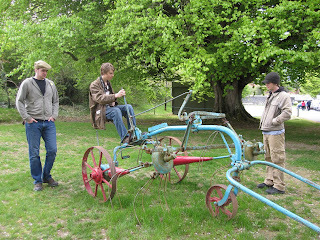 There were different examples of farming life ranging from small one-room cottages, to larger farms. Ballymaloe Cookery School is the dream come true of Darina Allen, one of Ireland's best-known chefs. 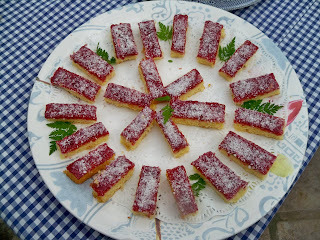 Her son, Toby, gave us a tour of their farm after we had a taste of some of the pastries from the school. The school began in 1983 and holds classes regularly. Toby showed us all of the innovative ways that the school is decreasing its carbon footprint and promoting others to do the same. They grow just about everything they use in the kitchens on their land. Including the bacon. 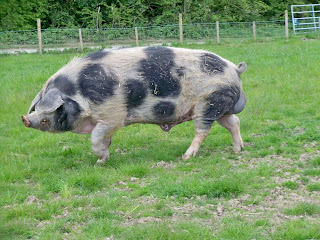 These pigs are massive. 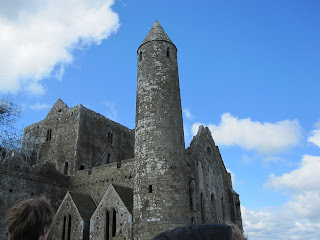 We left Cobh early in the morning and drove to the Rock of Cashel, one of the most visited and important historical sites in Ireland. 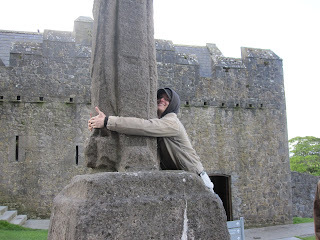 The Rock of Cashel was originally used in the 4th centry as a seat of the High Kings of Munster. 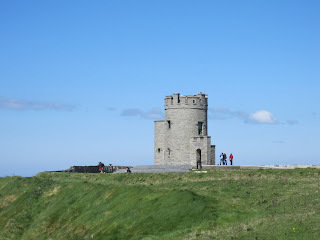 In 1101, the land was handed over to the Ecclesiastic powers that were becoming more and more prominent in Ireland. The piture below is of Jeremy ridding himself of tooth aches for the rest of his life. Local tradition says that anyone who can reach around this high cross and touch their hands will no longer have any tootch aches. 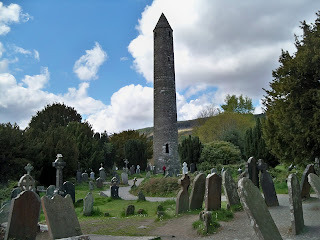 The site consists of St. Patrick's Cathedral, Cormac's chapel, a traditional round tower (similar to the one in Clonmacnoise), and the vicar's choral. 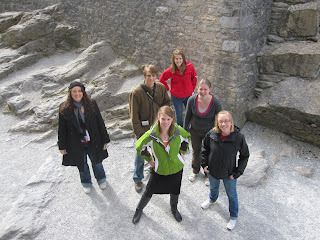 It was a very very cold tour and we hurried onto the bus soon after. 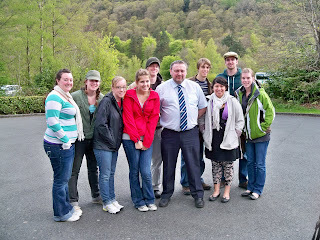 Our last stop monastic site was Glendalough. It was started by St. Kevin and like many small monestaries in Ireland, was outshone by the Romanesqe traditions and grand churches. 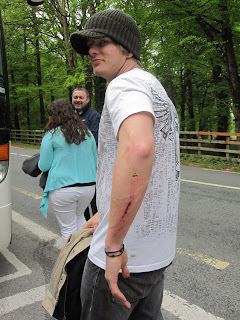 We arrived in Dublin around 6-ish and were very sad to see Damien go and to say goodbye to the beauty of Ireland's countryside. The weather, thank God, held up for the most part while we were taking our tours outside. Hopefully we'll be just as lucky on the second part of our trip. It is so good to have you back on-line ... your posts were greatly missed! Looking forward to reading about your adventures in Wales.